Disciplines: Fitter, Machinist, Welder (G&E), Electrician, Wireman, Cable Jointer, Ref.& A/C, Mechanic (M.V. ), Electronics Mech., Plumber, Boiler Attendant, Surveyor, Medical Lab Technician(Pathology), Medical Lab Technician(Radiology). Also read this post- Assam Govt Job 23rd April 2019. How to apply: Eligible candidates who wish to apply for the training will have to register themselves in the Govt. 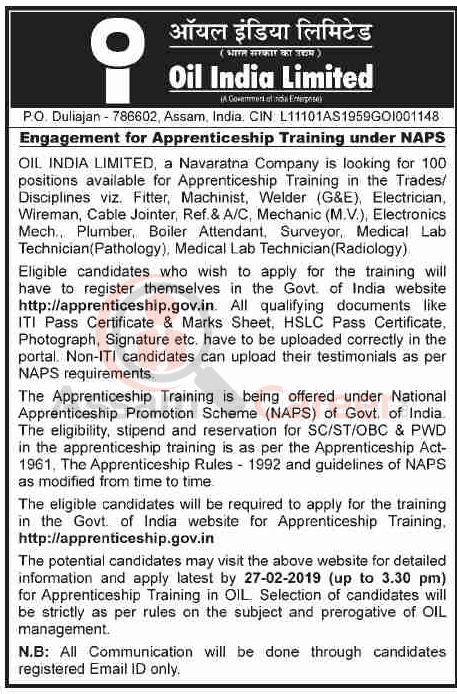 of India website http://apprenticeship.gov.in. All qualifying documents like ITI Pass Certificate & Marks Sheet, HSLC Pass Certificate, Photograph, Signature etc. have to be uploaded correctly in the portal. Non-ITI candidates can upload their testimonials as per NAPS requirements. Apply Online: Pl check http://apprenticeship.gov.in .